As per Census 2001, the urban areas in India account for 27.8 % of the population. About one-third of Urban India (71 million) lives in metropolitan cities. 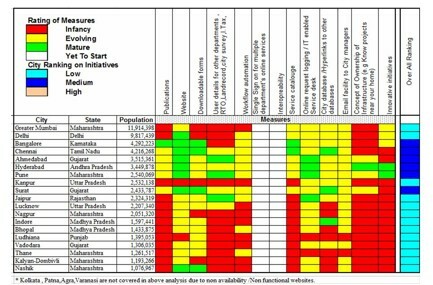 The number of such cities in India has increased from 23 in 1991 to 35 in 2001.Urbanisation is associated with increased incomes, improved health, higher literacy, improved quality of life and other benefits, at the same time it results in strain on the physical and social infrastructure. The job profiles in the mature urban areas are driving the need for an effective, efficient and economic urban service provider. The Urban Local Bodies (ULB) i.e. Municipal Corporation and Urban Development authorities play this role and use of Information Technology via e-governance initiatives is gaining momentum in the provision of the urban services to the growing number of urban customers. For a user of urban services, there are some basic requirements which are” Critical to Quality” (CTQs) for the service under consideration. These link to “Voice of Customer”(VOCs) in all process improvement initiatives. In the context of the current subject where the final aim is to deliver an improved urban service, the improvement measures for current processes need to be based on the needs of the end user. This paper intends to analyse the needs of the end-user and carryout a comparative analysis of the initiatives implemented to gauge the extent of fulfilment of customer needs across the top Indian cities. India’s population rose from 350 million at the time of independence in 1947 to 1027 million in 2001. The projections are that it would go up to 1.4 Billion by 2026. This increase will be accompanied by large scale transformation in the rural-urban composition of the population. India’s urbanization is 28% (2001) and is expected to reach a level of 34 % by 2021.As per Census 2001, about one-third of Urban India (71 million) live in metropolitan cities. The number of such cities in India has increased from 23 in 1991 to 35 in 2001. India has a total of 423 urban centers managed by Urban Local bodies (ULBs). These urban local bodies are statutorily responsible for the provision, maintenance and up gradation of basic infrastructure services in areas of their jurisdiction. However these ULBs are experiencing tremendous financial stress even to operate and maintain the existing services at satisfactory levels. The job profiles in the mature urban areas are driving the need for an effective, efficient and economic urban service provider. This is due to the fact that urbanisation is associated with increased incomes, improved health, higher literacy, improved quality of life and other benefits. At the same time it results in strain on the physical and social infrastructure. The role of cities in country’s socio-economic transformation has been proved beyond doubt. This has lead to the national level initiatives like Jawaharlal Nehru National Urban renewal mission (JNRUM) and National Mission Mode Project (NMMP). Government of India ‘s Jawaharlal Nehru National Urban renewal mission aims to encourage cities to initiate improvement in existing service levels in financially sustainable manner. The National Mission Mode Project (NMMP) for Municipalities has been initiated by Ministry of urban development with a vision for e-Governance in Municipalities. The project also aims to leverage the Information and Communication Technology (ICT) for sustained improvement in efficiency and effectiveness of delivery of municipal service to the end user. The above initiatives focus on physical infrastructure development (JNRUM) and e – governance (NMMP) respectively. The introduction of mandatory reforms within JNRUM like process re-engineering through deployment of technology solutions to enable more efficient, reliable and timely services in a transparent manner , ensure that both the initiatives complement each other. The goal of these programmes is to equip the ULBs to provide services with reduced cost and time of service delivery processes to the end user i.e. Citizen of Urban area. In broad sense improvement of service delivery and robust maintenance / support mechanism is the intended outcome. Some of the VOCs for Urban Services in cities are mentioned below. Poor information availability on initiatives. Lack of clarity on procedures. Time consuming processes lead to ignorance. Lack of accountability of officials. Too many agencies and overlap of work. Refrain from lodging service requests for want of time. Feel left out from the decision making process. Addressing the VOC is key in selection of the projects for implementation. In absence of the same the impact of the initiatives is diluted for the want of a user base. is a tool widely used in process improvement initiatives involving Six Sigma approach. QFD involves capturing customer’s input (What’s) and translating them into technical solutions (How’s) for the technical team to act upon. The tool also brings out the prioritised list of customer requirements and potential solutions. Figure 1 below outlines the QFD Matrix with respect to the urban service provision. The customer requirements are derived from the Voice of customer as listed above. ICT initiatives for Local administration. Physical Planning Projects for City with a horizon of 10 yrs. ICT plays a key role in fulfilling the ‘What’s” which come out form the QFD described above. As it provided an interface for city administrator to interact with user seamlessly. Capability for Transactional Services: This stage is where users can carry out transactions; record their suggestions, requests online. Creation of Online communities: At these stage ULB website provides navigation to websites of various organisations within urban area enabling the participation of citizen in developmental activities and interaction with officials & NGOs. 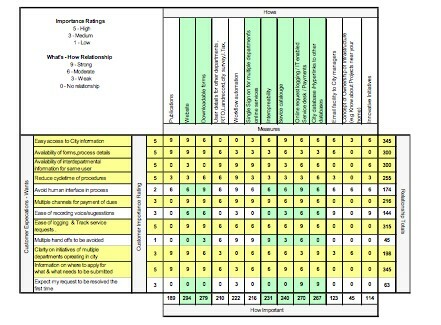 QFD matrix in Figure1 above depicts the potential solutions to fulfil the customer requirements. The extent of the provision of these was gauged through the assessment of the information / features of the websites of the top cities in the country. The result of the analysis is depicted in Figure 2 below. The e-governance initiatives in the major Indian cities are in state of infancy although ICT implementation is seen as prime agenda. Initiatives like Interdepartmental information exchange through Single Sign On, Interoperability are yet to start. Majority of initiatives with strong linkage to customer needs are evolving. The information provision is static as such does not gather desired customer response. of each other; as such the benefit of the initiatives is not fully utilised by end user. This also results in non availability of information amongst departments leading to lot of rework. Only few cities show up as providers of mature and innovative programs. The common platform for urban service provision is missing. Many of civic administrative bodies are not members of the Association of Municipalities & Development Authorities (AMDA) to drive a common set of initiatives across the country. There is a need of an integrated approach for the delivery of Urban Services backed by efficient service support mechanism involving a user interface. Shared IT infrastructure and adoption of ITIL framework is one potential solution.The ITIL processes aim at achieving high financial quality and value in IT operations. At the same time it aids the optimal use of IT infrastructure. Application of ITIL framework to the provision of urban services shall result in mutual benefits to the providers as well as its users. 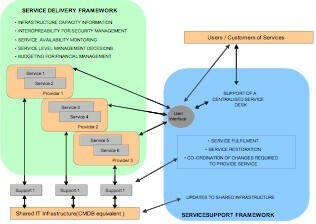 Figure 3 provides the ITIL view of urban services provisioning. Further prioritizing the initiatives using the customer centric approach like the one described above shall lead to rollout of solutions which shall have a user base. As we progress towards maturity of e-governance, there is a need for provision of IT enabled services in urban governance to backup the physical planning projects.